Kim Dotcom has announced plans for Mega, a service to replace his shut down file-sharing website Megaupload. 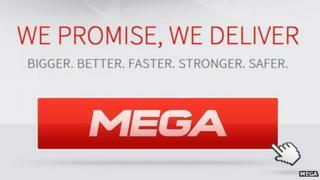 Mega is expected to use encryption methods which will mean only users will know what they are uploading. It will be decided in March whether Mr Dotcom should be extradited from New Zealand to the US to face charges relating to copyright theft. The 38-year-old said he would launch Mega on 20 January 2013 - a year to the day since his arrest. By keeping details of files uploaded on Mega secret from the site's administrators, Mr Dotcom said he believed this would mean the site was not in violation of US laws. "The new Mega will not be threatened by US prosecutors," he said. "The new Mega avoids any dealings with US hosters, US domains and US backbone providers and has changed the way it operates to avoid another takedown." Announcing the new site on Twitter, Mr Dotcom said the holding page - hosted at Me.ga - was already getting "millions" of hits. He said many of the visits were from US authorities themselves, tweeting: "All FBI agents pressing reload hahaha... We see their IP addresses. LOL!!!" Exact details of the encryption methods on the upcoming site have not been released. However, it appears to look to shift responsibility for unlawful content onto the users, rather than the site's owners. "In the past, securely storing and transferring confidential information required the installation of dedicated software," a message on Mega's holding page said. "The new Mega encrypts and decrypts your data transparently in your browser, on the fly. You hold the keys to what you store in the cloud, not us." In an interview with Reuters, Mr Dotcom suggested that content owners might even get direct access to users' uploaded files "if they agree not to make us responsible for actions of users". The site's servers will not be hosted in the US, Mr Dotcom added. A page on the Mega site makes a plea to encourage more investors for the service. "We have raised sufficient funds to cover the launch," the message reads, "but we would like to provide Mega free of charge for as long as possible." Mr Dotcom had previously released details of a sister service, Megabox, which will offer music-related downloads. Mr Dotcom - formerly Kim Schmitz - currently resides in his New Zealand mansion which was raided by local authorities at the start of this year. The raid and seizure of assets was later deemed illegal by a New Zealand court. It was also later ruled that intelligence agencies had illegally spied on Mr Dotcom - an incident which drew an apology from New Zealand Prime Minister John Key. "We failed to provide that appropriate protection for him," he said. "It is the GCSB's [Government Communications Security Bureau] responsibility to act within the law, and it is hugely disappointing that in this case its actions fell outside the law." If extradited and convicted in the US, Mr Dotcom faces up to 20 years in prison.